The Zymbol on this bracelet measures 1-3/8" x 5/8"
Pewter Wrap & Tuck's are a versatile, everyday bracelet that can be worn at the gym or out on the town. This adjustable bracelet is comprised of pewter with a stylish & durable cotton cord. Plus, it's the easiest bracelet you'll ever put on. Follow the 3 steps below. Wrap cord more or less depending on your wrist size. 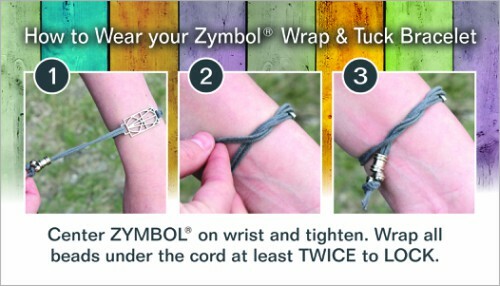 We offer Large and Small Wrap & Tuck bracelets which refers to the size of the Zymbol, not the size of the bracelet. Take a look at the images above to see a comparison picture. Center Zymbol on wrist and tighten. Wrap all beads under the cord at least TWICE to LOCK.